Sounders FC hosts Toronto FC in regular-season action. 47' - @clint_dempsey acrobatic effort goes just wide. Someone in the press box just said, both teams are the same to start the second half. 49' - Free kick coming for @torontofc . 40 yards out off to the right. Michael Bradley looking for a runner at the back post, @brad_evans3 clears it. 49' - @torontofc cross by Ashtone Morgan skids across the front of the goal. 52' - @Obafemimartins run down the right side, finds @clint_dempsey at the back post. Forces a save from TFC goalie Chris Konopka.
.@SoundersFC attacking in waves to start the second half. 56' - Good pressure by @torontofc to start the half. Seems like they decided to press. 58' - @Stefan24Frei forced to make a spectacular save diving to his left. Pushes it wide for a corner. 59' - Ashtone Morgan cross headed home by @torontofc 's @_AIR_RIQ_ still forward from the corner kick. Now tied here @CenturyLink_Fld 1 to 1. 61' - First change for the @SoundersFC . @Haedo18Valdez9 replaces @LamarNeagle . 62' - Chris Konopka forced to make a spectacular save after an @friberg28 cross and an @Obafemimartins strike. 62' - @ChadMarshall14 header cleared off the line as well. 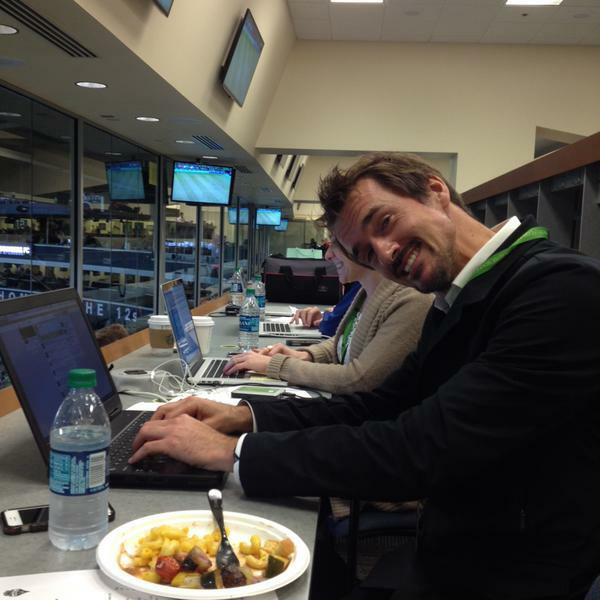 @SoundersFC swarming but Chris Konopka has been up to the challenge in net. Tonight's attendance, 39,960. If you were here it would be 39,961. Thanks to those in the stands and those tuned in elsewhere! 67' - Another acrobatic effort from @clint_dempsey . Next up for him, the balance beam. 68' - @torontofc whistled for a foul just outside the box. 69' - @tye free kick effort cleared by a jumping wall. On the foul, a yellow card was issued to @torontofc Marky Delgado. Unfortunately just his first of the night. Good battle by @OzzieAlonso and Michael Bradley. 71' - @Obafemimartins sprung on the right, and almost in on goal. His chop cleared away by a recovering defender.
.@CenturyLink_Fld is in the game for 2016! Take a look behind the scenes of the making of @EASPORTSFIFA ????
. @Haedo18Valdez9 with touch out on the left, but his cross does not clear the first defender. Looking more and more like @torontofc is content to sit in and let @SoundersFC come to them. 77' - Goal. @SoundersFC . Scintillating run by @Obafemimartins down the right flank. Experience shining through as @clint_dempsey follows up Chris Konopka's save. 77' - Just so you got it. Goal. @clint_dempsey . @SoundersFC now lead 2 - 1. And has great hair game.